We are going to look at all the options and main services that are available for you to find a tradesman when you need one. The first two approaches to finding work described above are very traditional and well understood, so we are not going to labour them here. It is the last two that are newer and therefore more interesting. Buying leads can suit a tradesman very well, as they can pick and chose the work they want and dip in and out when they have time. There is no need to get a whole advertising campaign going when you might only need a few little jobs before the next big one starts. Theoretically you get straight the homeowner and he either picks you or another tradesman to do the work. The big issue has always been what they are buying as there is a huge amount of trust involved; is the information they are buying genuine, how serious are they about going ahead with the work and how many other people will buy that “lead”? Many tradesmen struggle to trust organisations providing these services, although this is beginning to change as the approach is becoming more established and organisations offering these services prove to be reliable. There is a balance to be struck, as a customer wanting to get the work done, you want to have enough quotes to make a balanced decision but the tradesman doesn’t want too much competition either. You also have to agree to have your details shared. This is again something that requires trust, but again this solution becomes more established you can trust these organisations to look after you information better too. This approach deals with all the trust problems that you have with using a lead generator; you don’t provide your details and no tradesman has to buy them in the hope that you are genuine and serious about your project. With all the money they collect from the tradesman that subscribe to their services these organisations have big advertising budgets that they can promote their subscribers with. Few tradesman can have adverts on the radio, let alone on the TV or sponsor the football, but with this approach they can, albeit with indirectly alongside other tradespeople who also use the service. For you this solution is easy; you go to the website and search for the trade in your local area. You will then be presented with a list of relevant tradesmen nearby. You can read their profiles and reviews from their customers and you decide who you want to contact directly. This who industry was pioneered by Checkatrade and it’s founder Kevin Byrne. His big innovation was to check and vet every tradesman that joined his scheme. While he would admit that it is not 100% failsafe his checks are more than most homeowners generally do despite being very important. There are now other organisations who offer similar solutions. The first big name to copy Checkatrade was Which? with their Trusty Traders scheme. More recently John Lewis has developed a solution, but only for limited areas. Amazon has also launch a solution too, although we don’t yet know the levels of checks that they are promising. We mentioned that commitment it important. It is something that is often overlooked especially with the narrative of “rogue traders”. There is an expectation that the onus is on the tradesman to prove themselves to you, the customer. 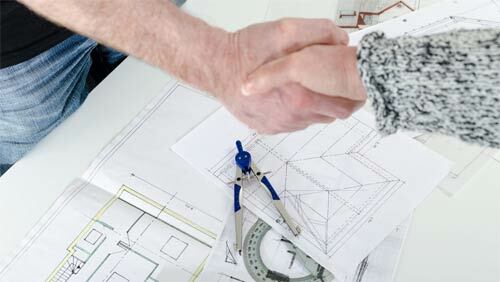 Respect – Being a builder or tradesman is an active career choice and a good builder will have a wealth of experience. Most do it because they love it. And it pays well – you might remember our newsletter about how brickes are now paid more than architects! You should also check your tradesman, even if you get their details from a site who does a lot of the checks for you. There are still cowboys out there and it is your home so it is your responsibility to protect it. Find out more about avoiding the cowboys here.